One might think that because I have been known to make my own bread, cheese, and lots of other yummy creations (like these, and this, and this!) that I would also have tried canning. Though I would love to have a bounty of homemade jams, lemon curd, and veggies stored up for winter, the truth is that canning intimidates me. Because of this inner conflict (it sounds much worse than it is! 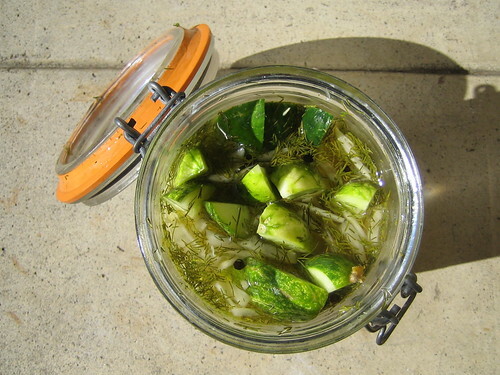 ), I was thrilled to find this recipe for homemade pickles in Real Simple magazine. The ingredients were all easy to come by (I think I already had everything except pickling cucumbers) and they take only 1 day to pickle, thus providing the almost instant gratification I usually get with cooking/baking. I did modify the recipe by subbing regular white vinegar for white wine vinegar and used chopped dill weed instead of seed. I also reused the brine for a second (and third) batch of pickles, since we devoured these in a couple days (I topped the jar off with a splash more vinegar both times). I plan to try repeating this process with carrots, beets, and brussels sprouts soon! What about you? Do you can or pickle? Want to? I make pepper sauce, which is sort of picked: you cover the peppers (washed and stems removed) with vinegar, add a good amount of salt, and blend to a thin mush. Bring to boil, simmer 20 minutes, blend again and bottle. I usually add some dried ancho and chipotle peppers to the fresh (normally red Fresno peppers for me, but ripe jalapeños would be nice if I had a garden---and I'm dying to try it with those tiny green Thai chilis). I've canned ginger-peach jam, garden salsa and most recently grape jam. We picked nearly 13 lbs of concords & muscadines from the grapevines that are growing around our back porch. I used a recipe that I found at epicurious.com; with just grapes, sugar and lemon juice (though I added a bit of powdered ginger for a little flair). I didn't want to use surejel or pectin & it turned out nicely though it took a really long time to cook down. I'd plan to do more canning so I can become more confident with it. 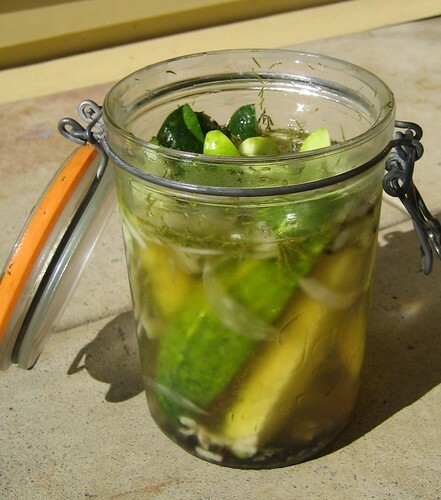 Your pickles look amazing - if they taste as good as they look they must be divine!